I’ve been watching a lot of How I Met Your Mother lately. It was on sale the other day so I picked up a season. It’s funny what you can pick up and learn from a TV show, especially when what you’re getting from it is not anywhere close to what the writers had in mind when they created it. So, for those of you that have been living under a rock and don’t know what the show is about, here’s a quick summary. Five people live in New York and it’s narrated by Ted, who’s telling this story twenty years later. He’s telling it to his kids about “How he met their mother”. Anyway, long story short, Ted dates a lot of different girls, thinks they’re “the one”, jumps in head first and the relationship crashes and burns so then he goes on a string of frivolous dating, gets fed up with that and says he’s done looking. Now, we as the audience don’t know who “the mother” is. (Well, at least not at the end of season 8. I haven’t watched 9 yet. Don’t spoil it for me). We only know one thing, that she carries a yellow umbrella. We, as an outside viewer, know that’s who he ends up with, we just don’t know how. So, how does this apply to real life? Why am I talking about a TV show in my post about dating, or rather about not dating? Well, bear with me. Maybe at some point this will all make sense. I’m kind of bad about going down rabbit trails and hopefully tying all the knots together and it making sense on the other side. We’ll see how it ends up. Alright, so my first point: The yellow umbrella. 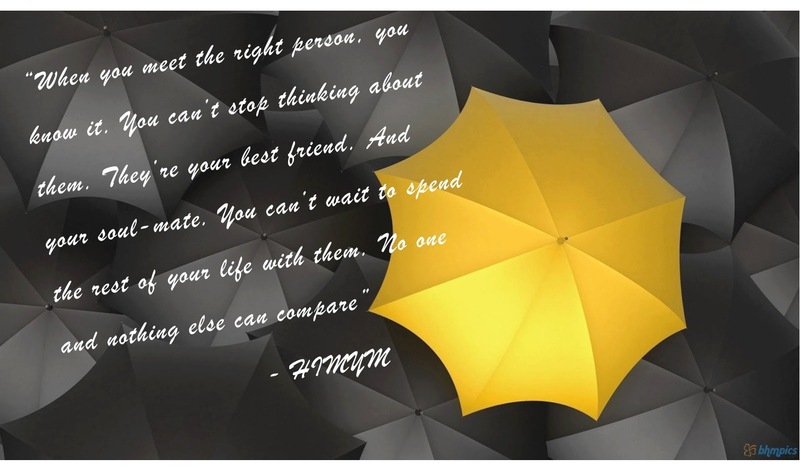 We know that yellow umbrella girl is “the one” for Ted. It’s been told to us, so every time we catch a glimpse of that yellow umbrella in a crowd, we get excited, we think it just might be time for destiny to collide. But it’s a TV show. The characters aren’t real people. They have plot lines and backstories and futures mapped out for them, literally, not just metaphorically. The writers know exactly how the story ends and, even though the actors may not know the ending, Ted, Marshall, Lilly, Barney, Robin and Umbrella girl aren’t real people. So what about the idea of “the one” in real life. Is there someone out there that was meant to be with me? Am I meant to be with a specific person, or is it just a random pick, “hope I get lucky” kind of thing? While there isn’t biblical proof for “the one”, I’d like to think that God knows who I’m going to marry. Disclaimer: Nothing that I’m writing is necessarily biblical. There is no black and white answer to this question. This is just a little “Bri-sian” theology for you. Take it with a grain of salt. God has a plan for our life. That plan usually has to involve other people. Whether those people are used to refine us, bring us joy, grow us in some way, or we’re the ones refining someone else, God uses people to make people holy and to bring people closer to Him. That being said, a spouse is going to do all of the above and so much more. They have more influence on your life than any other person will ever have. So don’t you think it’s a fair assumption that that person probably isn’t someone picked at random? Don’t you think that God probably has someone in mind that He wants us to be with so that their strengths and their weakness grow us and they grow from us? Now, I’m not saying that if for some reason, we don’t end up with “the one” that it’s the end of the story and we should just give up on life. Not at all. We have free will and we have a choice in the matter. We aren’t robots. God will work in our lives regardless. A pastor I heard once said “They may not have been ‘the one’, but they became ‘the one’ the minute you said ‘I do’”. This is why it’s so important to listen to the will of God. He’ll talk to you, maybe not audibly, but through people (hey, wasn’t I just saying that? ), through peace, or the lack of peace you have with a decision and through other things. James 1: 4-6 (NIV) – If any of you lacks wisdom, he should ask God, who gives generously to all without finding fault, and it will be given to him. But when he asks, he must not doubt, because he who doubts is like a wave of the sea, blown and tossed by the wind. Now, onto my second point. Now, this one actually may have been planned. It’s not a biblical concept, and makes sense even outside of a Christian perspective, but there’s also a lot of wisdom in it. In the middle of season eight of How I Met Your Mother Ted has literally been kicked out of his own apartment and his things are flying from the upstairs window, something is floating down in flames and Ted sits there, looks off into the distance and says “I’m done dating”. While that’s just a simple statement, there’s a lot of power behind it. He’s done doing things to bring himself temporary happiness, and finally looking for something permanent. And that’s exactly what happens. This crazy woman throwing things out of his apartment is the last woman he dates before he meets his wife. There’s a lot of wisdom in putting off temporary happiness for now and searching for permanent joy. And by searching, I mean waiting. Ted didn’t go off in search of the next girl. He went to meetings and interviews for his next job, he spent time with his friends and worked. He became content where he was at, to a certain extent. And that’s the key, being content where you are. Psalm 37:4-5 (NIV) – Delight yourself in the LORD and He will give you the desires of your heart. Commit your way to the LORD, trust in him and He will do this. So, what’s the moral of the story here? Well, I’m not sure there is one. Except this, I’m done. I’m done dating for temporary happiness and I’m tired of trying to make something happen. God is going to bring the right person to me. I’ll let Him bring my yellow umbrella to me.